New Delhi, March 7, 2017: Owing to the upcoming Holi long weekend and subsequent holiday season many airline carriers recently announced a drop in their flight fares. 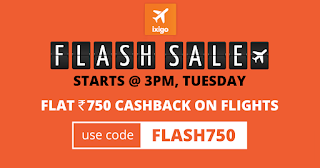 Adding to these already reduced air ticket prices, travel metasearch ixigo is all set to carry out a 1 hour long Flash Sale on flights on the 7th of March, Tuesday from 3 - 4 PM. On booking a flight in this hour, users are entitled to a flat cashback of Rs.750. All they have to do is open the ixigo flights app or website between 3-4 PM on Tuesday & search for flights; choose a travel partner (Cleartrip, Yatra, Musafir, etc.) with a Cashback offer mentioned with the fare and apply coupon code: FLASH750 at the time of making the booking. Users will receive their cashback in their Citrus Wallet within 30 days of booking, which can also be transferred to their bank account. For those who don’t already have the ixigo flights app, can get it here and take advantage of this not-to-miss offer. Launched in 2007 in Gurgaon, India by Aloke Bajpai and Rajnish Kumar, ixigo is India’s leading travel search marketplace, connecting over 80 million travellers with content & deals from over 25,000 online & offline travel & hospitality businesses. ixigo aggregates and compares real-time travel information, prices & availability for flights, trains, buses, cabs, hotels, packages & destinations. ixigo’s mission is to simplify the lives of travellers by building apps that make their travel search and planning hassle-free and it has won several awards in its journey, including the TiE-Lumis Entrepreneurial Excellence Award and the NASSCOM Top-10 Emerge Award. ixigo’s investors include SAIF Partners, MakeMyTrip & Micromax. Join ixigo on Facebook and Twitter for more updates.